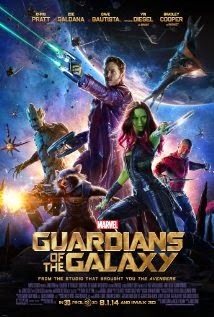 starring: Chris Pratt, Zoe Saldana, Bradley Cooper, Vin Diesel, Dave Bautista, and more. This movie has gotten a lot of hype after it's release, which gave me high hopes for seeing it. However, I was not as impressed with it. Okay, sure there's more to it than that, but that's the bare essentials. The obvious reason why this movie is unlike other super-hero movies is because the main "good guys" are all selfish jerks. But these characters have more depth to them than that. They just want to live freely, surrounded by friends. Life has handed them many bad situations and they are trying to make the most out of it. Rather than these being the good guys which have faults which can be typical for the protagonists in a story, they are the bad guys which have good hearts deep inside and therefore are not the true villains. I don't think it was a terrible movie. I wasn't drawn to the soundtrack much either. I just probably wouldn't watch it again. Also, a part of me wanted to see Peter's mother say "With great power, comes great responsibility" only because Peter's the main protagonist in a comic-book movie. I'd give this movie 3.5 out of 5 stars.